The Winchester Mansion or Winchester Mystery House in San Jose, California is a very popular haunted mansion that many visit annually. Nestled amidst luxurious shrubbery and beautiful tropical flowers and plants, the Winchester Mystery House appears anything but haunted. Behind the beauty of this mansion and landscaping that it resides on, there is a story…a story of spirits. A story that I will introduce you to here. This story will simply amaze you…it is so odd, so spectacular, and so mysterious! September 30th 1862, a spectacular wedding took place in New Haven. This was between a lady named Sarah Pardee and a man named William Wirt Winchester. Sarah was born into a wealthy family and grew to have a natural knack for languages and social events. She had a splendid personality that was much larger than her four foot ten inch body frame. William was also from a wealthy family and took his professional life into creating new and advanced weapons in the form of guns. Four years after they married, they would welcome their first child into the world, Annie Pardee Winchester. This was the beginning of happiness and tragedy…. This particular medium really set the pace for the life that Sarah would lead from that point on. She convinced Sarah that a curse had been set upon the Winchester family. This was due to a particular weapon that had been used to kill many people. These “souls” were out to take revenge on the Winchester family due to the fact that they created the weapon that ultimately killed them. She was informed to move, and once she located her home, she should build and build on it so that she could live. It was told that if she stopped building, she would, too, meet death. She finally located her home, which was being constructed, on a large 162 acres. She purchased the home and hired workers that would build for her. This included twenty something workers that worked day and night, every single day of the entire year, every single year! This went on for a length of 36 years! Her favorite number is rumored to be 13. This is why you will see steps, and panels and numerous other items in the home in the amount of 13. Doors leading to no where, stairs leading to the ceiling, and numerous other designs were integrated into this odd home in an effort to remove any and all bad spirits that sought to do her harm. It was believed that the design was a maze that would work to confuse the spirits that sought to do her harm… Once, an earthquake nearly destroyed the home. Sarah was convinced that the spirits were angry. She immediately started restorations. 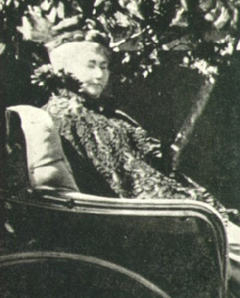 At the age of 83, on September 4th, 1922, Sarah Winchester went to lie down in bed. Within a short time later, she passed away in her sleep. 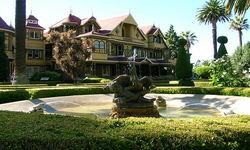 While it is believed that this haunted mansion does host a number of friendly ghosts, and perhaps even the spirit of Sarah Winchester, it is not believed that any of the supposed “evil” spirits still remain at the Winchester Mystery House…. Here is some video of the Winchester Mystery House.